International IoT Day is here! April is coming, and with it one of our favorite days: The IoT Day. It is a worldwide event which will take place on April 9. The IoT Day is the meeting point for markers, developers, entrepreneurs, industry leaders or basically any person interested in technology, around the Internet of Things. The April 9, there are several events around the world scheduled to celebrate this important date discussing about IoT and what is capable of. In this sense, Cooking Hacks banks strongly on the Internet of Things and wants to promote it around the world. We want to encourage to all makers to develop IoT solutions, and what better way than by using our products. 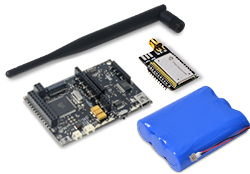 Discover our IoT Starter Kits fully compatible with a wide range of devices and with the most well known communication protocols (LoRaWAN, Sigfox, 3G/GPRS, WiFi, etc.). From Cooking Hacks we have prepared three promotion weeks to celebrate the IoT Day with you. We start today and we will disclose the new promotion weeks on following Mondays. They will be related to our IoT products. The key day of these promotion weeks has come. The IoT Day is on April 9. To celebrate this date we want to boost the worldwide interest in IoT offering a 10% discount during this week in our new IoT Starter Kits category until April 10. These IoT Starter Kits are the perfect combination between a sensor platform and a communication protocol. In this case, the kits are equipped with the successful open source Waspmote Sensor Platform, designed by Libelium. Besides, they are available with the most well-known communication protocols as Sigfox, LoRaWAN, LoRa, WiFi, 3G, ZigBee and GPRS+GPS. Their distinctive characteristic is that they are fully compatible with our Waspmote Sensor Kits, the ideal choice for monitoring solutions.